Landlocked sea lamprey are suspected of staying in the Cheboygan River system and feeding. Photo: Great Lakes Fisheries Commission. CHEBOYGAN, MI – Researchers who are studying sea lampreys in the Cheboygan River system are looking for a little help from anglers over the next couple of years. Evidence is mounting that a landlocked population of lampreys exists in the Cheboygan River watershed, which includes the Maple, Sturgeon and Pigeon rivers, along with Burt and Mullet lakes. 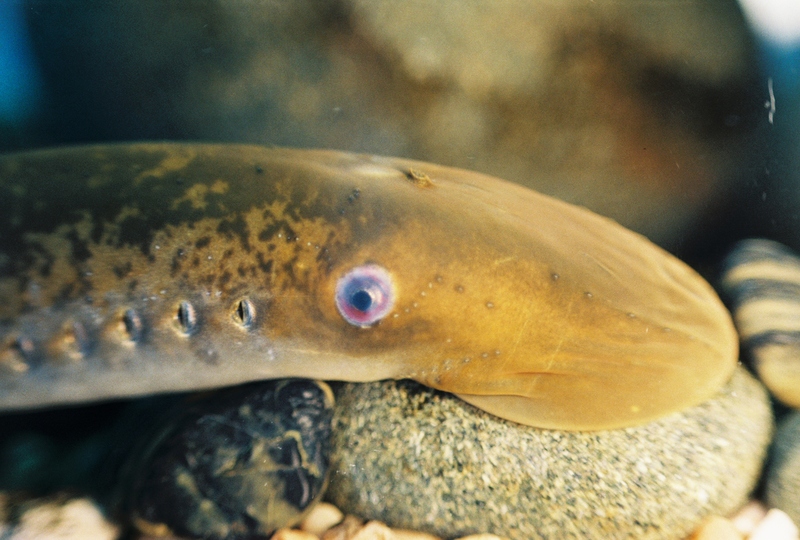 Landlocked means the lampreys don’t migrate out to the Great Lakes to feed – in this case Lake Huron. Instead, they emerge from river bottoms where they live as larvae, make their way downstream during their metamorphosis to a blood-sucking parasite, and stop short of Lake Huron, feeding on fish Burt and Mullett lakes before eventually returning upstream to spawn and die. Federal officials say that phenomenon not only has implications for sport fish that live in those waters, but for the agencies tasked with sea lamprey control. Until recent years it has been assumed that Cheboygan River lamprey migrate out to Lake Huron and return to spawn. The river system has been treated with lampricide for more than 50 years. Now federal officials are considering other lamprey control options like sealing the Cheboygan dam and locks so lamprey cannot pass, then killing off any residual populations with chemical treatment. It is a move, they say, that could save a great deal of money for treatment, a cost estimated at $1.5 million every three years. 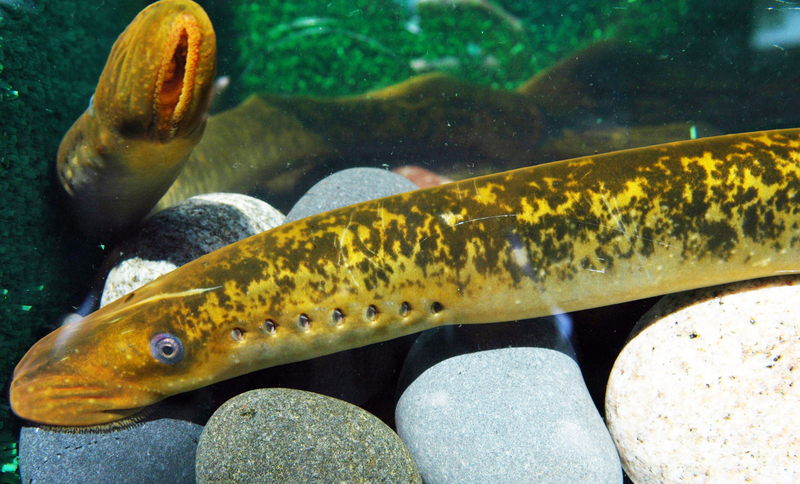 “Lampreys have traditionally lived in those streams and lakes,” said Nick Johnson, a research ecologist with the U.S. Geological Survey’s Hammond Bay Biological Station in Millersburg. “What’s new is they may be stopping for a snack in Burt and Mullet Lake(s) without going out to Lake Huron. Lamprey control in the Cheboygan River watershed began in the 1960s, but state officials say it remains one of the biggest lamprey runs on the Great Lakes. Johnson plans to trap lamprey on the Maple, Pigeon and Sturgeon rivers this year and next, from April through July, looking to assess the population size and their genetic makeup. Spawning lampreys typically appear in late April or early May once the locks begin to operate. The 2-year netting study follows a 2013 pilot study funded by the Great Lakes Fisheries Commission that provided some evidence of a potential landlocked population. Cwalinski said their presence makes no difference to the fishery, though anglers have reported the occasional fish with a lamprey wound. The question of their presence has more bearing on what happens to the locks and dam in the future and whether federal agencies would be able to save money in treatment. The DNR, he said, prefers to not to see barriers to fish passage on rivers. Marc Gaden said the study is important. He is a spokesman for the Great Lakes Fishery Commission. “I view it as fact finding,” Gaden said. “We’re trying to find out what is going on. Have the lamprey expanded their range? If there is an expansion that could inflict damage to fish populations on Burt and Mullet Lake, we want to know. Anglers are being asked to contact Johnson if they find lamprey wounds on sport fish in the Cheboygan River system, and to turn in any lamprey they find. Johnson can be reached by email at njohnson@usgs.gov or by phone at: 989-734-4768, extension 128. Flyers posted at various boat launches detail how to send in a lamprey or observation. Observation coupons are available at bait and tackle shops in Indian River, Onaway and Petoskey. This entry was posted in Uncategorized and tagged Cheboygan Michigan, Cheboygan River, Conservation, DNR, Environment, Great Lakes Fisheries Commission, Lake Huron, Michigan Department of Natural Resources, Nature, Sea Lamprey, U.S. Geological Survey. Bookmark the permalink. Evidence isn’t mounting that Sea Lamprey are in Burt Lake, it is proven ! I caught one in August of 2013 and turned it in to the MDNR at the Burt Lake State Park. I’m glad they are giving this the attention it deserves and hope they can eliminate these from our inland waters. Thanks for your comment Paul. The evidence is not about sea lamprey per se. It’s about having a landlocked population. Thanks for turning that bad-boy in. What this study suggests to me, is the importance of following the laws prohibiting the use of Lamprey as bait. To me, this study suggests that if someone transports Sea Lamprey upstream of a dam, it would not be surprising for some of these lamprey to remain in the dam pond after transforming into the parasitic phase and spawning in streams above known barriers where surveys for Sea Lamprey are less frequent. This could add to the number of lamprey reaching the Great Lakes and to the cost of treatment to control them.